When: Saturday, January 26th, 2019- Setup and registration starts @ 10:00 AM EST; Play will start @ 11:00 AM EST. Tourney Format: Similar to the Tecmo Equalizer format, group play will include 4 players in each group playing one another in round-robin format. Groups will be formed based on skill level with seasoned veterans and former tourney winners in the same groups with newer guys in other groups. Matchups for group play are decided based on matchup cards. Once group play is completed, all players are seeded in the bracket and are seeded according to their finish in their group standings and record. Players then draft their team that they will be using for the rest of the tournament until one champ remains! Equipment: We need Nintendos, TVs, Controllers, Carts! If you are able to bring any of these in working condition, please let us know what you can bring and how many of each. If you are able to provide any television sets, please let us know the size and any kind of hookup (Coax/AV Cable). Prizes: Trophies and cash prizes will be awarded to top three participants. All participants will be eligible to win raffle prizes throughout the day! How to Register: Registration online at northeasttecmo.com will be up shortly! Pre-registration is $20! 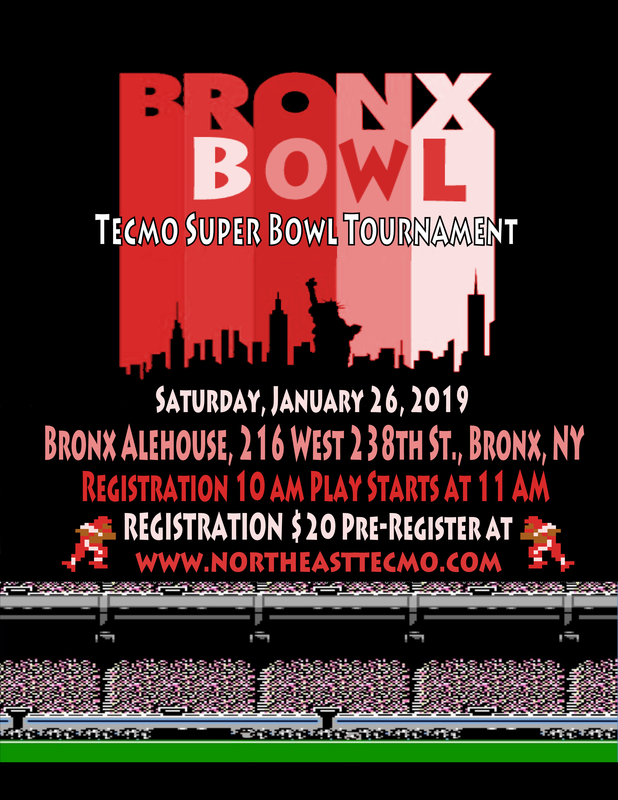 Come out and participate in Tecmo in the Bronx! Thanks! I will try to follow along tomorrow's action. I am talking it over with some others on how we can tweak it to optimize for our players. You guys always have solid turnouts and I'm sure you would like to see some other passionate Tecmoers in your area with a shot at a title. I think this will work out well for you, just as long as your elite players are up for the challenge. Looking forward to it. Format sounds interesting, test to the ballers out there. One oddity remains: in such format if one player takes 1 team for the duration, that limits the field to 24 players total. 28 teams - Tier 1 = 24 teams and thus limit to 24 players. This seems strange. Thoughts? @stuball44 Thanks! The Equalizer format is mostly a model for now. In theory, 28 players would be ideal because that means every team would be taken. If less, we were discussing taking out a few teams (either really good like the Niners or bad like the Colts). If we do, however, exceed the number of teams that are possible to draft because we get above 30 people, my thought was to have one side of the bracket draft and the other side of the bracket draft separately so that two guys with the same team don't play against each other. We'll have a better sense of the number of participants a couple of days before and will adjust accordingly. We'll announce the official draft/lottery format in the next week or so. We want to test it a few times to see if the format works. @Nameless Loser Parking in the area is mostly free street parking unless it's along Broadway which I think is metered during the day. There is also a new strip mall behind the bar with a BJ's and a Buffalo Wild Wings and there is usually parking there. I've had friends park there without a problem. It's right along the 1 train, which you can get at Penn Station and take uptown to the second to last stop, W 238th Street. I think we will be good with the CRTs for this one, but if you drive, having a spare never hurt! first get rid of Niners, Colts so down to 26. Then have 2 separate sides (say AFC on left side of bracket and NFC in right side). That can accommodate up to 52 ppl. when the winners of each side meet for the final & they are both the same team then the final can be same team vs same team w/ use of everdrive. example: if KC is the left “afc” side of the bracket winner & KC also the right “NFC” side. When they meet in finals afc team uses The KC team as they are and the other team has a duplicate of KCs roster Put on any team. Chances are won’t be same team in both if have more than 26 ppl there. Group play will include 4 players in each group playing one another in round-robin format. Groups will be formed based on skill level with seasoned veterans and former tourney winners in the same groups with newer guys in other groups. The tournament will then move to a team draft based on a lottery system explained below. Team Selection: Group Play: One player randomly chooses a matchup card from the deck of Matchup Cards. Afterwards, a coin is flipped. Winner of the coin toss gets first player and chooses either the team they wish to be or the controller they wish to use. Team Selection: Bracket Play: Team selection for bracket play will be a team draft. It will consist of a lottery with a choice. Draft order is decided by number of wins. The first player will draw team names out of a hat corresponding to the number of wins he achieved in bracket play. That player may choose one of the teams to use for the duration of the tournament. If that player does not like the team(s) drawn, he can pull out one more team at random but must use that team. Starting the Draft: Barry wins three games in group play. This means he gets to pull three teams out of a hat. He draws: Minnesota, Cleveland, New Orleans. He can choose which of the three teams he wants. The best team he chose is Minnesota, which he can decide to keep, or choose one more team from the hat, but MUST stick with that team. He decides to risk the picks and draws Denver. He must use Denver for the rest of the tournament. That team is now Barry’s and is removed from the drawing. After all of the three game winners have picked: Jerry won two games in group play. He picks two teams: Atlanta and San Diego. He could decide to choose another team, but opts to stick with San Diego. After all the three and two game winners have picked: Jackson won one game in group play. He draws one team (Cardinals). He decides to risk picking again knowing that after the three and two win players have selected, a couple of better teams are still in play. He draws the Buccaneers. All of the winless players: Lawrence did not win any games in group play. He picks a team out of the hat and is stuck with that team the rest of the tournament. He draws the Cardinals and must keep them. These twists on the format will potentially make it even more challenging for the top players. Sounds like fun. Have you guys figured out a stream solution for your tournament? 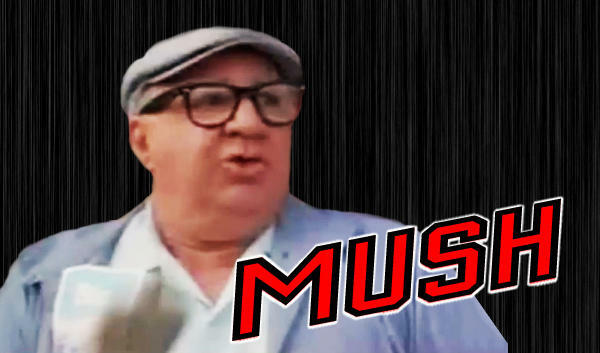 Remember, if you lose on a last second JJ, someone forgot to put Mush in the bathroom. - Probably most insightful quote of day: "Why did we finish early and everyone is happy? More TVs" (we had complete simultaneous play for everyone. fortunate that the event/venue/number of players lined up that way) Also of course it made it easy to play friendlies, even TSB III, very little downtime. - Access and parking was surprisingly easy. In this case Van Cortlandt park was all free (@badmoonrison indicated good weather in winter was responsible) and the traffic was smooth. Everyone has to take a different route to this thing, but I for one appreciated no Brooklyn-Queens Expy nightmare. - This venue laid out as a long row with TVs stacked on either size. Size of the row still accommodated flow between TVs. With the two facilities on either side and bar around the corner it really seemed to accommodate the crew extremely well. What a crazy day. Never could have imagined this format would have revolutionized the way I have viewed this game for so long. Can't give Brian enough props for pulling it off. Absolutely everyone enjoyed themselves. Great seeing everyone. Did long winded recap on Hoffs podcast so this will be the bare bones. Got 1 win in pool play honestly don't remember the game DEN over SD. Lost to DeGorge PIT over CLE, and Brian R. HOU over GIA to go 1-2, limiting my "team draws" to 2. Got stuck w/ GB and then ran the table, every one was a good game. GB over SEA, PIT, RAI (GG Ant), final 4 v RAMs MattyD (OT), Championship v PHI Barletti (OT). Cheers fellas. Until the next time. -If anyone has the video from any of the final 3 games please post or send them my way it's all pretty blurry at this point. Hell post any good pictures from the day as well for prosperity. 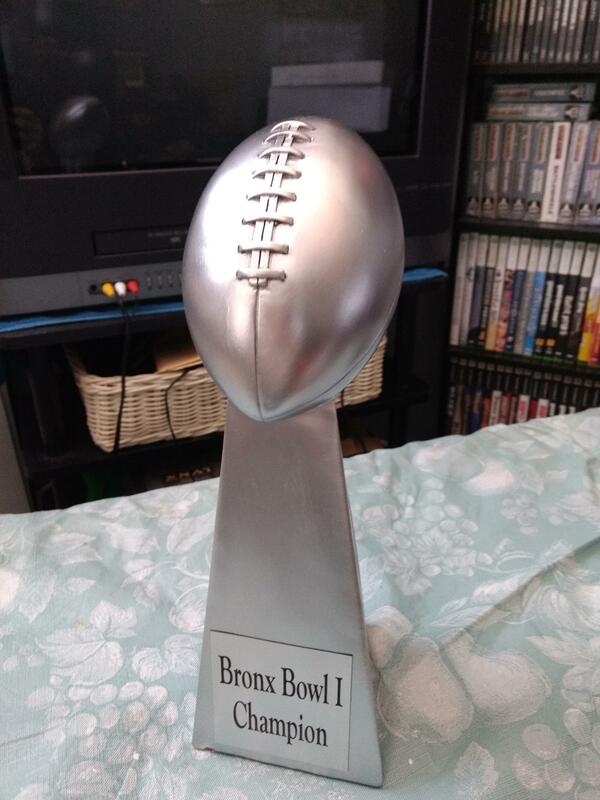 Thanks to everyone who came out to the first ever Bronx Bowl! When it was their time to draft, players with 6 pts got to pull three teams, players with 4 pts two teams, players with two points one team. You then had to choose which of the teams from the ones you drew that you wanted. If you didn't want any, you got one more pick, but you had to stick with that pick. Congrats to Bo and thanks again to everyone for coming out! Awesome time and loved the format. Was very happy to go 2-1 in a pretty tough group and picked PHX and DAL. Took the gamble and threw them back and picked CLE. Yikes. I had beaten Barletti in a NO/JET matchup in pool play but he drew PHI, I kept it to 7-3 at the half but he pulled away in the second half. He almost went all the way and lost in a classic OT game against Bo’s Packers in the championship. Winning it all with GB is damn impressive, mad props to @oklahoma. Thanks to Brian for running a great tournament, this one was a lot of fun. Between this, NYC in Oct, and LI Retro you’ve put in some serious work for us NE Tecmoers and it’s much appreciated. Always great to see the usual NE suspects too. Congrats @PatrickB1008 on a great run to the final four! Happy for you man. Hope we do this again next year it was a blast.